This beautifully written book by the renown Italian motor sport journalist, Severo Boschi, gives a fascinating insight into the magic of motor racing with Maserati in the early days. 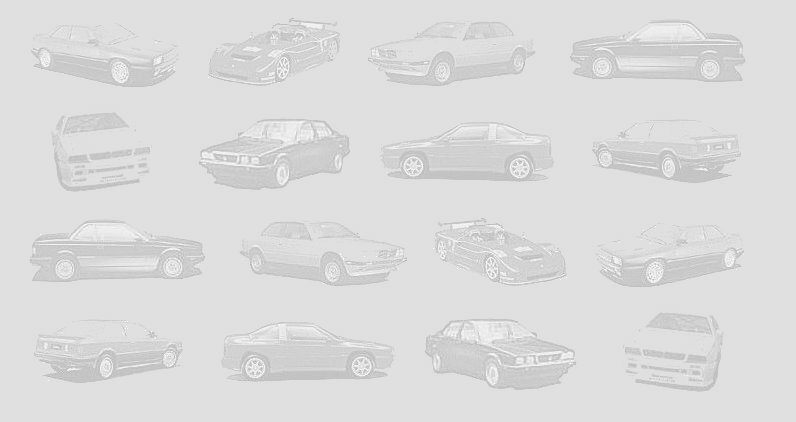 Packed with some stunning monochrome photos of the cars and their drivers. The final chapter in entitled eighty five engines in the history of Maserati. A copy of this rare book and now my Maserati library is complete. 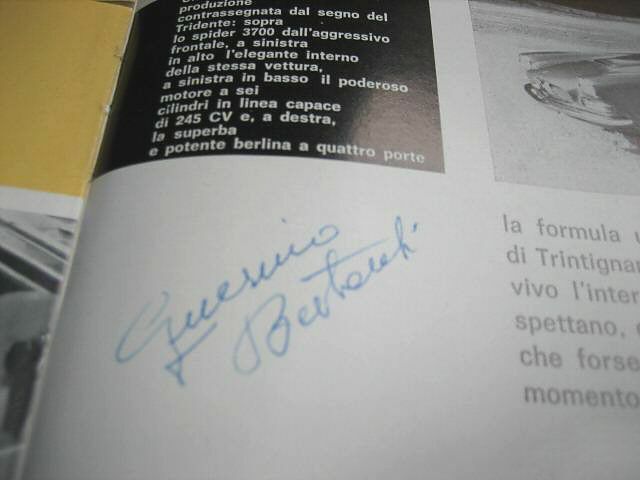 In good condition, this copy contains the signature of the legendary Maserati test driver Guerrino Bertocchi. Drawing of the Tipo 26. Bill of sale to Tazio Nuvolari. 1935-1940 1940 Drawing of the Tipo 4CL / Schedule of modifications for Tipo 8 CTF (five documents). No 2 sales brochures for electric vehicles. Certificate from the 'Concorso D'Eleganza Monte Carlo'. Drawing of Tipo A6 GCS chassis. Drawings by Michelotti (2 types). 1962-1967 Mistral brochure / Quattroporte brochure. 1998 Giugiaro 3200 GT drawing (rear view). 3200 GT original sales brochure. This is wonderful 'portfolio' produced by Maserati for the supreme enthusiast and contains a number of facsimiles of important bills of sale, technical drawings, sales brochures and Maserati literature from the archives of the 'Casa del Tridente'. Produced in a limited series of 1998, of which only 498 went on general sale. Maserati SpA and Giorgio Nada, the editor, are to be congratulated for their foresight in the production of this 'Faldone'. In excellent unused condition it is priced at £300 plus postage. A well written and well researched book with many monochrome and some colour photographs. Opens with a chapter entitled 'From the beginning until 1925', a brief story of the Maserati brothers. 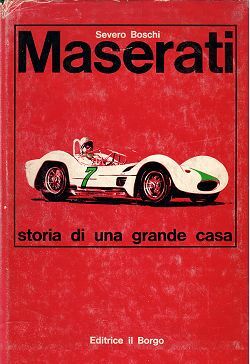 This English version was produced in a single volume and covers the complete Maserati production story with chapters on every famous racing, sports and GT car up to and including the Biturbo. Each chapter contains technical specification, production numbers and some fine technical drawings. In excellent condition and complete with slipcase this book is priced at £150 plus postage. A well written and well researched book with many monochrome and some colour photographs. Opens with a chapter entitled 'From the beginning until 1925', a brief story of the Maserati brothers. 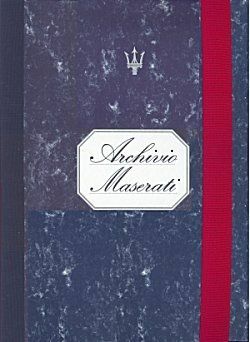 This Italian version was produced in two volumes encased in a slip case; one covering the period from Maserati's origins to 1945, the other from 1945 to the Biturbo. It covers the complete Maserati production story with chapters on every famous racing, sports and GT car up to and including the Biturbo. Each chapter contains technical specification, production numbers and some fine technical drawings. In excellent condition and complete with slipcase this book is priced at £300 plus postage. A well written and well researched book with many monochrome and some colour photographs. Opens with a chapter on the Maserati Brothers and ends with a chapter on the departure of the brothers from the factory. 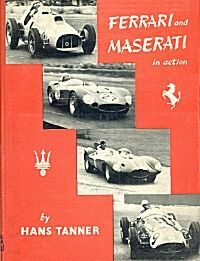 This first volume covers the complete Maserati production history from 1925 to 1945, with chapters on every famous racing and sportscar, from the Tipo 26 to the Tipo 8CL. Each chapter contains technical specification, production numbers and some fine technical drawings. In reasonable condition, this book is priced at £100 plus postage. A well written and well researched book with many monochrome and some colour photographs. Opens with a chapter on the Tipi A6 - A6GCS and A6G, the book covers the complete Maserati production story with chapters on every famous racing, sports and GT cars up to the Biturbo. Each chapter contains technical specification, production numbers and some fine technical drawings. 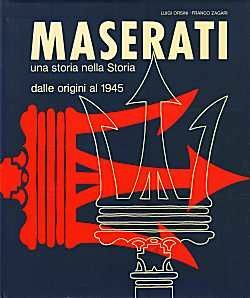 An excellent softback book containing a lengthy chapter detailing Maserati production from the Tipo 8CL to the Tipo 60/61 Maseratis. Interesting chapters on the tuning and maintenance of the 3500GT, the 200S, the 450S and the A6G/2000. Chapters containing horsepower and torque graphs for many competition models. Not a history but a brief account of the racing contests between these two great marques from 1946 to 1956. Brief chapters on the Italian GP, Syracuse, Mille Miglia, Monaco, French GP, Le Mans, German GP, Barcelona, Swedish GP, Argentina, 1000 km of Buenos Aires, British GP, Nassau, Sebring, Indianapolis and Daytona Beach. Ends with a chapter entitled 'Ferrari and Maserati out of action'. This book contains over 150 black and white photographs but the text is brief. 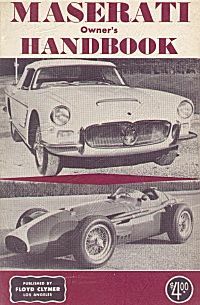 A softback 224 page landscape book detailing the development and background of the great Maserati sportscar racers from the A6GCS of 1947 to the Tipo 65 of 1965, of which total production was around 200. Chapters on chassis and engine number identification, production data and technical specifications. Well illustrated with many important colour and black and white photographs. A superbly written and well researched book by a gentleman who has owned/owns a number of Maseratis. A hardback 204 page book detailing the development and background of the great Tipo 60 and 61 sports cars. Well illustrated with many important black and white photographs. 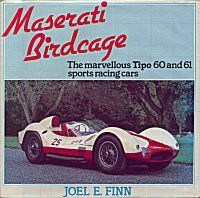 Superbly written and well researched book charting the racing history of the 'Birdcage' Maseratis. The appendix contains detailed technical specification taken from official Maserati records. In excellent condition this book is priced at £150 plus postage. Copyright: Enrico's Maserati Pages - © 2017. All rights reserved.